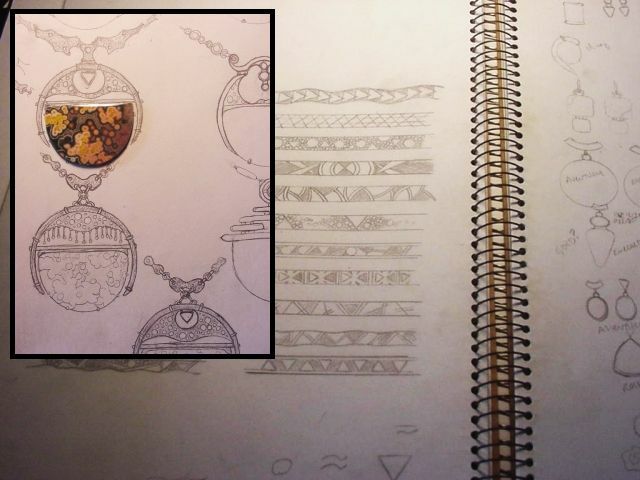 Once you've got a few stones picked out it's time to draw out some designs. I often start by tracing the stone directly into the sketchbook, like you did with the cut out shapes. Look for patterns within the stones themselves. Build on the shapes you already have. Start simple, you're ideas will grow with time. Repetition and variation can be great. If you have a square stone and want to design a pin with it, trace 20 squares and start drawing around them. Don't spend too much time on each one, just play. The first drawing and the 20th probably won't look much alike. Go back and pick a few favorites and redraw them. Now your designing! Many lines of jewelry start off this way, one good design and lots of elaborating on it.